The spectacular Hotel Russell, situated on Russell Square in the heart of London was built in 1898 by the architect Charles Fitzroy Doll and was one of the first hotels in London to feature an innovative feature for it’s day – en-suite bathrooms! The hotel has some interesting historical links to the Titanic – the restaurant in this hotel is said to be almost identical to the one on the Titanic, which the architect also designed. Owned by the Principal Hayley Group, in the summer of 2016 a complete refurbishment of the hotel by S&T Interiors began and Rhino Shrink Wrap were contracted by MR Scaffolding to provide scaffold shrink wrapping to completely encapsulate the scaffolding around all four exterior elevations. Scaffold shrink wrapping was chosen to provide containment for the hydro blasting works, weather protection during the winter months and also to provide a smart & professional appearance to this construction project which will not be finished until 2017. However, scaffold shrink wrap is not the right solution for everybody and every job. Hopefully this example project will highlight why other scaffolders and contractors have used shrink wrap sheeting and help you advise your customers if shrink wrap sheeting will benefit them on their next project. What is scaffold shrink wrap? Scaffold shrink wrap is a type scaffold sheeting which is made from a low density polythene that has been engineered so that when heated, it is shrinks powerfully and moulds tightly (but does not stick to) whatever it covers. Scaffold shrink wrapping is also designed so that it can be heat welded together in such a way that any joints between sheets are strong and permanent. Because there is no limit to the number of sheets that can be welded together, there is no limit to the size of the project that can be shrink wrapped. The most common size of scaffold shrink wrap used is a 1.8m wide roll (which weighs 32Kg / 70lbs) which unfolds to a sheet that is 7m wide (23’) x 15m (50’) long. Because it is 7m wide, this means that it is normally used to cover up to three lifts of scaffolding, or around 6m (18’). However, the size of the ‘drop’ will change according to the job. For an indoor scaffolds, such as might be used for a factory partition, there is no limit to the drop, whilst for a very exposed outdoor job, it might be better to drop the sheeting less than 6m before tying it back to the scaffolding. A shrink wrap used for scaffold wrapping should be around 300 microns thick, which is sometimes referred to as 12 mil in the USA. Again, 300 microns or 12mil has become the standard thickness for scaffold shrink wrap films that are going to be used for weather protection or environmental containment outside. This gives you a wrap that is heavy duty enough to cover a scaffold but still flexible enough that it is still easy to heat weld together. How is shrink wrap different to ‘traditional’ scaffold sheeting? Fundamentally, it is the two unique characteristics of the shrink wrap scaffold sheeting (the heat shrinking and the welded joints between sheets) that make it different to traditional types of scaffold sheeting. For example, once it has been fixed to the scaffolding and heat shrunk, it creates a very tightly fitting sheet which will not flap and self destruct like some types of sheeting. This makes it really strong and robust. The second result is that it is possible to create a completely sealed skin around a construction project without any holes or gaps typical of most sheeting systems. This makes it really good for those projects where the containment of dust and debris or whatever is required. Why was shrink wrap sheeting for scaffolding chosen for the Hotel Russell, London? This construction project is a great example of why scaffolders and contractors choose shrink wrap sheeting. On this job we’re encapsulating all four sides of the scaffolding, which in effect a complete block of London. When finished we will have hung around 7000 square metres or 75,0000 square feet of scaffold shrink wrapping. So, why is shrink wrap sheeting being used on this project? Firstly, as part of the refurbishment process, the fantastic terracotta exterior of the building is going to be water blasted and as this site is located in a very busy part of London, it’s important to completely contain the water and dirt that is going to be created as the building is cleaned. Traditional scaffold sheeting, which has gaps between overlapping sheets, would not be particularly effective at containing the dirty water and spray. Also, as a fairly long term and high profile construction project, there is a need for the scaffold sheeting to look smart and professional over many months, whatever the weather is going to throw at it. A good quality shrink wrap will have a very high yield strength which in effect means that it has elasticity and it can ‘bounce back’ to it’s original taught & tight state. Unlike traditional scaffold sheeting, there are no elasticated bungees tying this sheeting to the scaffolding which can stretch over time and cause the sheeting to become baggy. Instead the sheeting is wrapped around a scaffolding sheet and heat welded back on to itself. They required a sheeting that will not detach. Shrink wrap is often used for projects where the sheeting detaching would cause problems. They need to create a completely ‘completely sealed skin’ around the building to provide the best containment of dust and debris. They needed a sheeting that looks smart & professional and will keep looking smart & professional for up to 12 months. With traditional style scaffold sheeting products, which are generally installed on a ‘lift by lift’ basis around the scaffolding, protruding transoms, ledgers and standards do not cause much of an issue for the installation of sheeting, because the scaffold tubes stick through the sheeting at the point the strips of scaffold sheeting overlap. 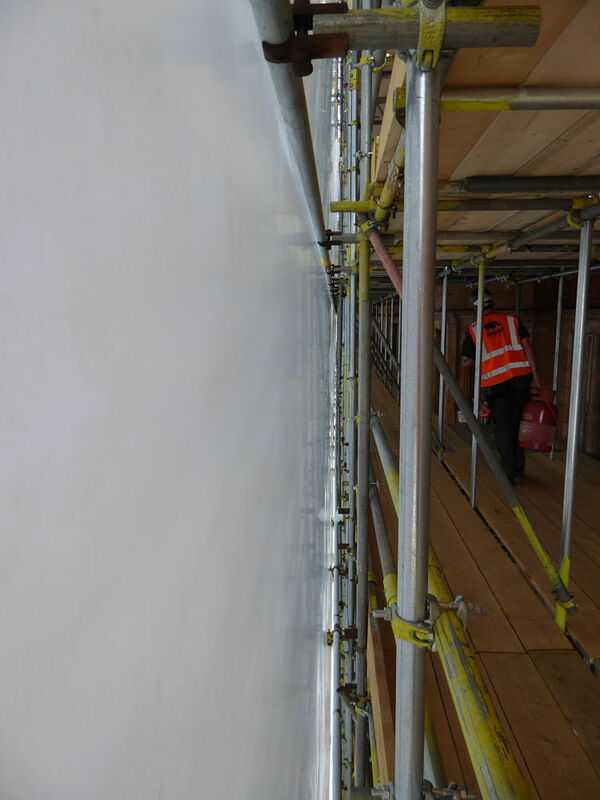 For shrink wrap scaffold sheeting, which is normally supplied on a roll which opens out to 7 metre wide sheet, having to cut around protruding tubes, whilst not impossible, can affect both the appearance and performance of the finished job. System scaffolds are the easiest to shrink wrap but in the UK at least, these are still the minority of scaffolds on which we work day to day. 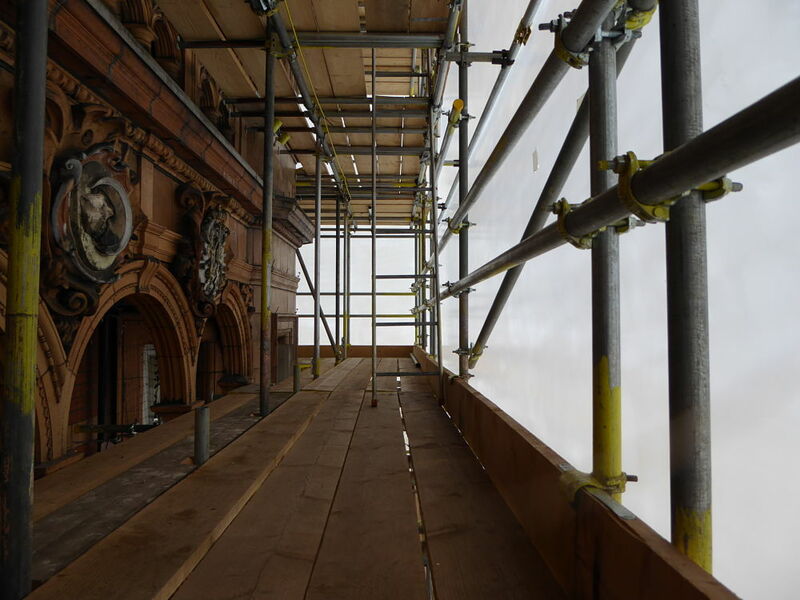 As the appearance of the sheeting was considered to be of great importance to this project, the team at Rhino worked closely with the team at MR Scaffolding, and it was decided to install sheeting rails on the outside of the scaffolding structure which would hold the sheeting away from the scaffold fittings. 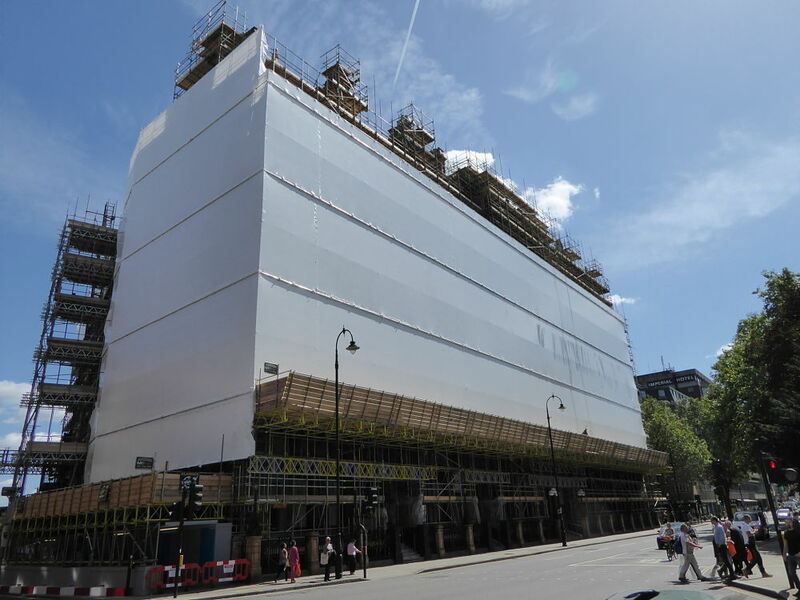 As of the time of writing, the installation of shrink wrap sheeting around The Hotel Russell in London is ongoing. Follow us on Facebook, Twitter or LinkedIn to be kept updated with progress. Remember that at Rhino Shrink Wrap we also supply materials, equipment and training as well as providing a full installation service so whatever your requirements, call or email one of our friendly team and we will be happy to help.